The ES-130 (formerly IC-1107) is a 3 channel, safe, reliable and easy to use unit. Ideal for busy clinics that require multiple units. Low/high intensity settings. Frequency range from 1-500 Hz. Suitable for needles. Unique wave pulse minimizes excessive charge build up in the tissue. With its fresh new look, the ES-130 is a compact, lightweight, sturdy, palmsize, high quality Japanese electro-therapy device. Featuring a High/Low switch on the back of the unit, the switch is toggled to Low to facilitate use with needles or to High for MEA electro-therapy. 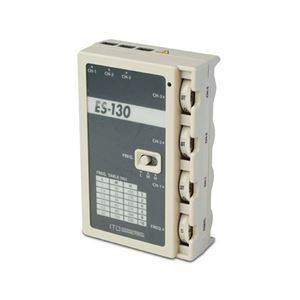 It offers three independently controlled output channels with adjustable frequency indicated by a flashing light. The waveform is a unique biphasic pulse which has been designed to minimize electrolysis damage to the needle. The pocket portable ES-130 is the smallest and smartest looking professional electro-therapy unit in the world, for use in or out of the office. This unit is not equipped with a point locator. Accessories included: .3 X Lead Wire with alligator clips .1 X 9V Battery .1 X Carrying Case Specifications: . Independent intensity channels . Frequency: L - 1 to 20 Hz M - 20 to 150 Hz H - 150 to 500 Hz . Low volts & current: 0 to 10 volts, 0 to 20 milliamps . Hi volts & current 0 to 20 volts, 0 to 40 milliamps . Voltage max: 30 volts (100 kohm load) . Pulse width: 100 microseconds (µS) . Pulse shape: asymmetric biphasic square wave . Pulse mode: continuous . Power source: one 9 volt battery . Freq indicator: flashing red light . Size, wt, color: 4.5" x 3.2" x 1.2", 0.3 lbs, gray Note: When using 9-volt Duracell Batteries with the ES-130, a thin shim (or paper) must be placed at the bottom of the battery to make proper contact (ie, Duracell are shorter in length). Also, in order to use the built-in battery check (located on the back side of unit), power must be turned on. THis unit is not CSA approved.